When I first heard that the most well-known sponge in history was going to be on Broadway, I scoffed a bit. How could this animated cartoon live up to the legend of Broadway? Would it work? If it did, how? And most importantly...would it be any good? Currently, New York theater is being dominated by adaptions like Mean Girls, Disney's Frozen, and the upcoming production of Pretty Woman: The Musical. Well, surprise because I'm here to tell you that SpongeBob SquarePants: The Musical not only works, but it's one of the most delightful shows I've seen. Read below my top 5 reasons for why you should see this show if you get the chance. The plot of this show is simple and is basically an extended episode of the show or maybe a short movie. It opens on SpongeBob waking up and about to enter another day in his hometown, Bikini Bottom. As everyone is going about their day, the citizens end up learning that a nearby volcano – named Mount Humongous – will erupt at sundown the next day. The entire town goes into chaos while everyone tries to figure out how to spend the next 24 hours. SpongeBob however is ready to be the hero again and takes it upon himself, along with the help of his two best friends, to rescue his city from the certain destruction. 1. The original songs by a plethora of well-known artists. The songs honestly are one of the best parts of the entire show. They do a fantastic job of being a mix of traditional Broadway sound while still not giving up the playful nature that the animated series has. The cartoon itself is known for having a pretty generous amount of original songs and any one of these musical tracks could be in an episode. The songs are written by greats like Cyndi Lauper, John Legend, Panic! at the Disco, David Bowie, Sara Bareilles and more! Cyndi Lauper writes my favorite song on the score, "Hero is my Middle Name." The song is sung by Sandy, Patrick, and SpongeBob. It's before they decide to go on their quest. The song is pop like in nature and hands down one that I will forever belt in the car. 2. The technical side of the show is both a child and designers dream. There is nothing that is too big in this production and that includes the technical design. Whether it’s the playground set, the costumes or the lights, people should be impressed. The set is bigger than life and is a whirlwind of whimsical delight by incorporating everyday objects into the underwater world. Coral reef structures jut out from the side of the stage and are made by pool noodles which I think is brilliant. At first I was a bit confused thinking “What was their budget? They couldn’t afford something nicer?” but then it hit me. This show really isn’t made for me, despite the fact I enjoyed the hell out of it. The show is made for kids and it does play with their imagination seeing common everyday items they are used to. It’s a very innovative set and will be interesting to see how it changes when they begin the national tour later next year. The designers also do a lovely job of incorporating little nuances from the actual show throughout the house and set. As the show opens in the first act you see a miniature set of three of the characters homes; Patrick’s rock, Squidwards face and SpongeBob’s iconic pineapple (under the sea). In the house there are also neon flowers and fishing hooks that are designed from the original animated series. The costumes are also exceptional. In a world where these live actors are re-creating animated characters (who celebrate their 20th anniversary next summer) it’s critical that they resemble the original without giving up too much creative liberty to the designers. SpongeBob dawns his signature, tie, high socks and brown pants, including a pastel yellow shirt to symbolize the actual sponge. Sandy sports an afro, in place of her astronaut head bubble she wears in the show. Mr. Krabs, who is in fact a crab, wears oversized boxing gloves in place of giant claws. By far the most impressive costume was Squidward’s which utilizes another set of legs behind his actual ones and move in conjunction with the actor’s real legs. The character Squidward, played by Gavin Lee, is known for being an amateur performer, specifically with his clarinet. Through out the production he continues to try to find the spotlight in trying to perform for the audience a solo number. Again and again he is shot down and overshadowed by other characters until he finally gets his shining moment, and it’s one of the most impressive ones in the show. Squidward performs the song “I’m Not a Loser” and taps his way, yes with all four legs, through a Broadway styled number with a kick line and all. This specific scene can be viewed online as it was apart of the 2018 Tony awards. A link to this performance will be at the bottom of this review. While the show is geared towards kids it does have its fair share of subtle adult humor and even lessons to be learned by everyone. There is a moment when everyone blames Sandy for the volcano’s eruption because she tries to use science to stop it. They say she is different also because she’s a mammal (Sandy Cheeks is a squirrel for those unfamiliar with the show). It should also be said that Sandy is typically played by an African-American woman. The show also deals with government versus people as the Mayor of the city tries to ensure everyone that everything will be alright. The Mayor adds fuel to the citizens fire by agreeing that it is Sandy’s fault and by starting a lousy task force. Again, the show is geared towards kids however I would have loved to see this theme explored a bit more. 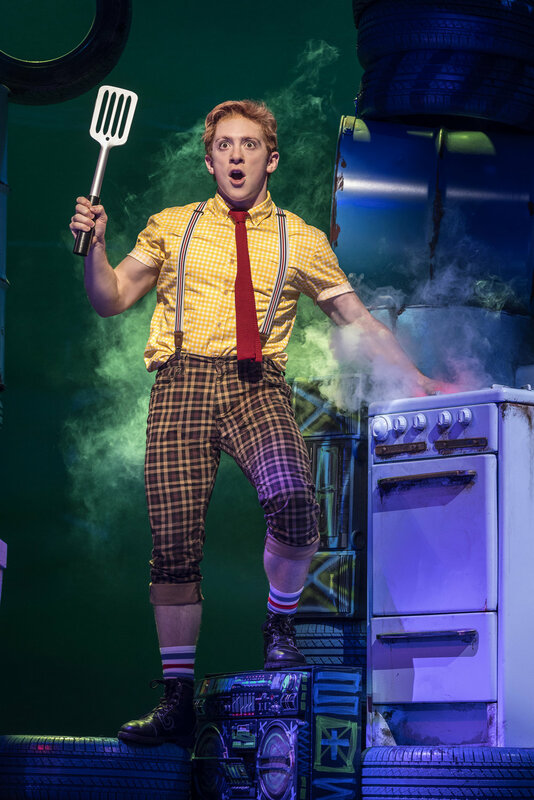 Everyone’s familiar sponge is played by Tony-Nominated actor, Ethan Slater and he is hands down the best part of this show. Whether he is bopping across stage, climbing structures and making it look incredibly easy, or belting out the soundtracks various hits, he’s a sensation to watch. He is certainly someone that Broadway should hold on tight to and never let go, because he has that star quality that makes him not only enjoyable to watch on stage but also excites me for his future and what else we’ll see him in next. Slater really does it all on stage. He acts the part without being a total copycat. His movement is spot on and don’t even get me started on that incredible singing voice he has. At times he sings like the character with a playful quality but other times it’s strong and powerful. I was in awe during the song “(Just a) Simple Sponge)” which is a power ballad and anthem for anyone who identifies as different. His incredibly high belt is enough to stand up in the middle of the show for. Never did I think I’d say to my readers and friends “Rush to see this show” but here I am stating it. Stating it multiple times. It’s unfortunate that it never really found its sea legs on Broadway, despite being nominated for over 12 Tony Awards, because it really is an incredibly charming show. It’s something that Broadway was missing and that was a show with heart. Just for the record it ended up winning Best Scenic Design and also won the Outer Critic Circle Award for Outstanding New Musical. The show sadly is closing at the end of this week, however, Nickelodeon said that the rights to the show would be available for school and youth groups early next year. If you are unable to see this show before it closes, don't fret because according to Nickelodeon it will also begin a North American tour later next year as well. 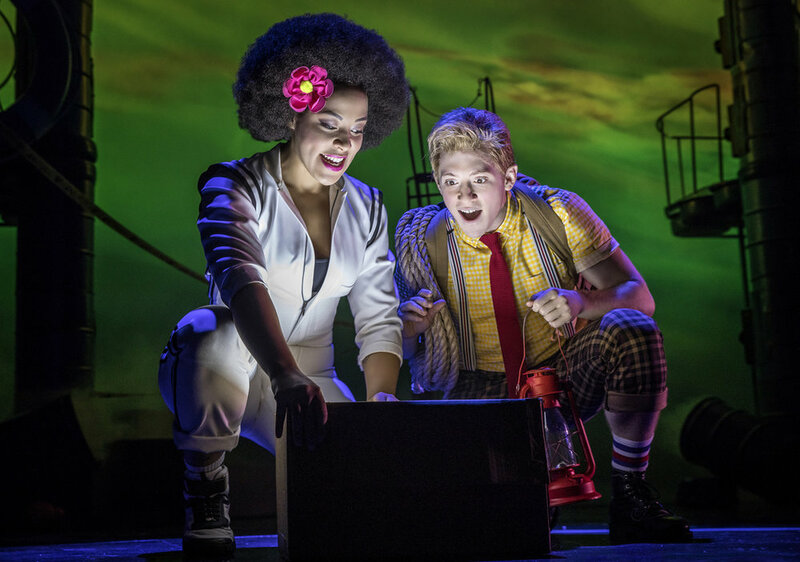 SpongeBob SquarePants: The Musical is currently playing at the Palace Theatre through September 16th. The soundtrack can also be streamed on Spotify and I highly suggest it.